Chateau Grange Cochard is at the heart of an ancient wine-making region. The Romans made wine here 2000 years ago, identifying the great potential of the granitic schist on the Côte du Py. Our aim is to make fine wine respecting this legacy, our magnificent environment, and our glorious mature vines. We have reintroduced many of the techniques and approaches used in former times which have fallen into disuse in recent years because they are difficult and expensive. We have also taken advantage of newer technology which allows us to minimise the stress that the grapes and wine can suffer. Our vines produce some exceptional fruit and our philosophy in the vineyard, in the winery and in the cellar is to allow the natural expression of the characteristics of our terroir. We are committed to sustainable viticulture, following a policy of minimum intervention using natural farming methods to nourish the soil and maintain a healthy and balanced eco-system. We do much of the work by hand. For example pre-pruning, pruning, trimming during the growing season, and removal of unwanted grape bunches and leaf growth, are all done by hand. 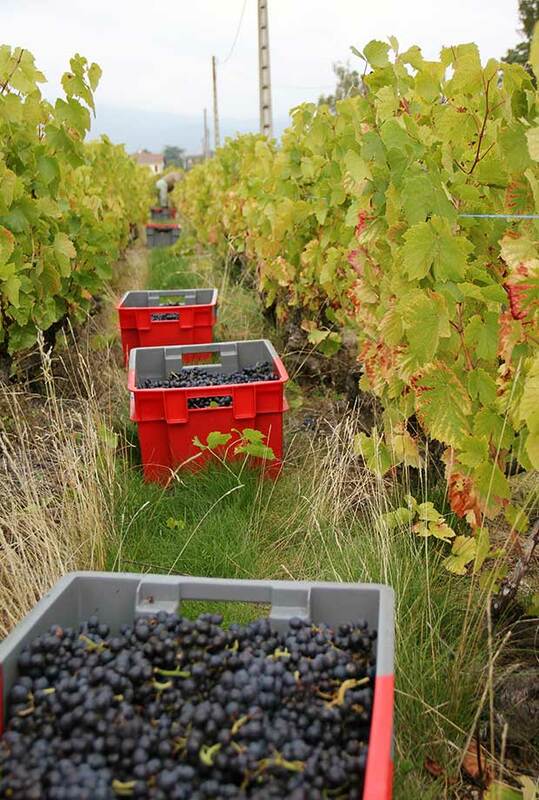 We pick all the grapes exclusively by hand not by machine and they are carried to the winery in small boxes rather than in large trailers to avoid crushing. It is fortunate that all our vines are very close to the house and winery, so after picking it is just a few hundred metres to deliver them in perfect condition. In the winery everything is done to treat the grapes as gently as possible. On arrival the small boxes of grapes are poured on to our vibrating triage table, which gently shakes off moisture and removes any dried berries. Either Sarah or James is always supervising the team at the table as this process is central to our philosophy. Any grape which you would not want in your own mouth should not be in the wine and is therefore rejected. In an average year we reject 10% of the harvest in this way. Using the automatic temperature control installed on our arrival we vinify at low temperatures to ensure a gentle and slow process allowing the natural fermentation to take its course without resorting to heat to speed it up. As a result we have long fermentation periods, normally around 15 to 20 days and sometimes longer. After the fermentation we empty the tanks by hand and again use conveyors to move the fermented pips and skins to the press, avoiding the use of aggressive pumping. Finally, pressing is gentle and slow to avoid any harsh tanins in the wine. Nearly all our wine is matured in French oak, some in old oak “foudres” and some in classic Burgundian barrels or “fûts”. These are large oak 3,000 litre barrels around 70 years old. Because the wood is old there is no oak taste. They are the traditional way of maturing a Morgon, but are not so much used today as they are difficult to clean and manage. Each year Sarah climbs inside through the tiny doors which measure only 36cm by 22cm to scrub and clean the insides. These old fashioned vessels provide a wonderful maturation for Chateau Grange Cochard Vieilles Vignes, totally distinct from maturing in stainless steel or cement tanks. 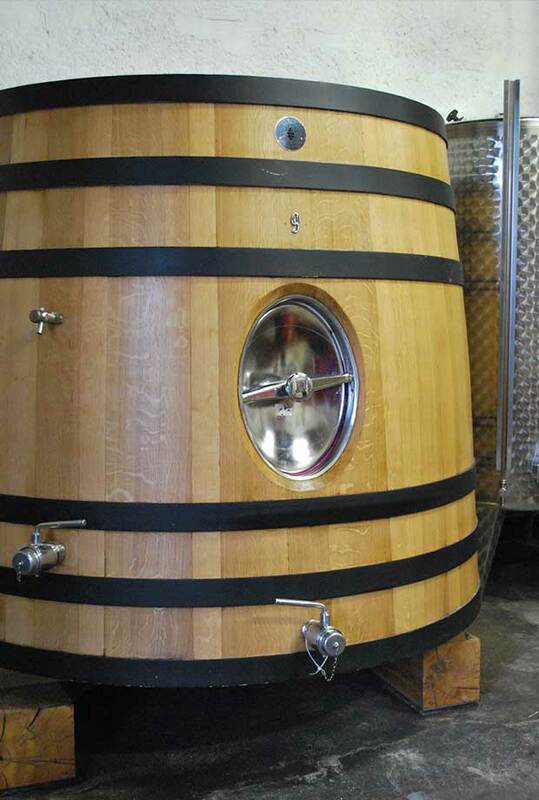 We also use for our other cuvées classic Burgundian style 228 litre barrels, both old and new. We are not seeking a strong oak flavour in any of our wines, so only about 10 to 15% of our barrels are new each year. Our new barrels are supplied by Tonellerie Chassin in Burgundy. 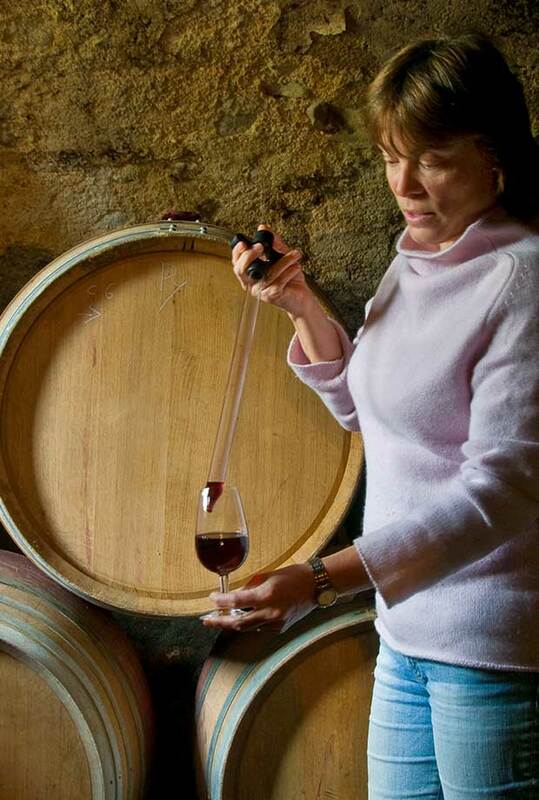 They are a small exclusive producer who supply some of the top names in Burgundy and worldwide. We taste with the tonellier the previous years wines matured in his barrels so as to discuss what forest we should use for the following year and any adjustments to the toast of the barrel. We leave the wine to mature in peace and quiet until summer or early autumn when we bottle. In order to minimise oxygenation and stress, we use inert nitrogen gas to push the wine back to the winery for the bottling process. As part of our philosophy of minimum intervention, we allow only very low sulphur levels. We always use less than 50% of the permitted amount (which is the generally accepted definition of “Low Sulphur”) and normally much less. Some sulphur is always present as it is a by-product of the fermentation process, and a minimal amount is necessary in wines which are intended to be kept for a number of years to avoid premature oxidation. After bottling we cellar the wine for a further season so as to give it the bottle age needed to bring out its full character. Take a look at some of our numerous awards and press comments.